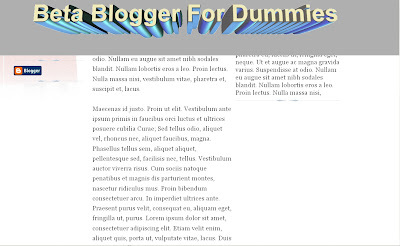 Fixed Header for Blogger. ~ The Blog Doctor. 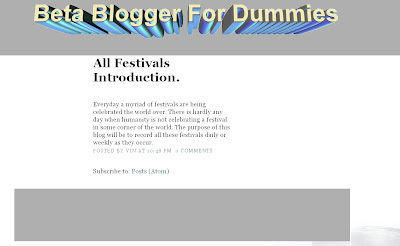 You are here: Home > Fixed header > Fixed Header for Blogger. 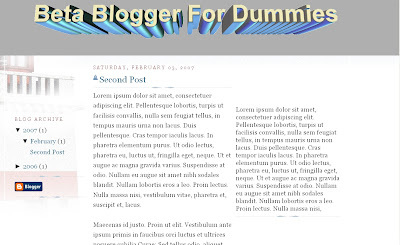 As an example I have hacked the new layouts of Blogger to reproduce this effect as can be seen here. See the screenshots below in which the header remains fixed in its place as the content magically scrolls into it and disappears. in your header css (#header). Now we have to position the header outside the outer-wrapper so that the content can flow into it. To do this scroll down into the body area of the template code and locate this code in the header section. Cut out this code and paste it just below the <body> tag. You may have a header-wrapper defined in your css. Then apply all the above settings to header-wrapper instead of header. 31 VIEWERS CLICKED HERE TO COMMENT ON THIS POST. ADD YOUR COMMENT. Thank you for all of your useful posts! I'm looking to make the image in my header not fixed so that the words scroll up into it, but I want the image to be viewed the same no matter what the screen size. Right now, my header fills my entire screen, but my sister told me that on her computer there's some white space. How can this be fixed? Thank you so much! Your sister probably has the wider resolution set in the Display Properties---->Settings tab---->Lower left corner of her PC. There is no template. Just modify the header code as shown in the post above. Hi Vin, You instructions are perfect! Thanks! I was wondering if there's any way to include the Blogger Navbar with my header so that there isn't a space above the header when the page scrolls? Yes Vin I would also like to be able to eliminate that space in between is there a way to do it, also I was wondering if I could get some help I did everything like it said in the post and it worked well but the header doesn't stay centered, so i fiddled around with some px numbers and stuff, I don't now much about this stuff just experimenting, anyway I got it so it looks fine on my computer but on other's it doesn't stay centered it goes off the screen could you please help me . oh and thanks for this blog it's great! here is the blog thank for your help. Can you send me the template? My email address is in the middle column. Well, I didn't have the navbar code, but I threw it in there and now the navbar is gone. That works for me, though! Is it possible to have only the main column (post) to scroll? I want the sidebar to stay still. Thanks for your help! It is possible to have a fixed sidebar but not recommended since only a limited number of gadgets can be added to it. If you add more they won't be seen since the sidebar will not scroll up! btw, i got the code for the frame from one of your entries, too! worked great! please help me fix it... thanks a lot! At the moment I don't see any picture in the header! is there a way to fix the footer? or is that too difficult because of differing screen sizes / resolutions? Thanks for posting this code unfortunately, I can't get it working. I am using the standard TicTac template, which has a header-wrapper, and I inserted the 1st part of your code in the CSS section. - it saved OK.
position: absolute; in the #header-wrapper CSS and the header became half the width of normal, and it still scrolls with the posts. When you edit the code in the template and save it the page will reload with the saved changes. If it does not it means the changes were not saved and you have to do it again. P.S. Do all experiments on a test blog first. Then when successful repeat on main blog. I am lost. Is it permitted to paste here the relevant code I edited? You can send me the code by email. is it possible to add the same effect on sidebar? ...where the main/post column is moving and tje sidebar is static -locked? ...where the main/post column is moving and the sidebar is static -locked? It is possible but it gives you a very small sidebar whereas now days you need a taller sidebar to add all the gadgets and advertisements. When the window is not maxed out, the sidebar moves over the background, and that's not what I want, I want the sidebar to be where it is (the same for the body), but I want to be able to scroll down. I don't know if I explained myself very well. Anyway, sorry for any disturbance and thank you for your time and patience. Is it possible to center the header??? I try the code above and it works fine, but i need to center the header, but it doesnt work for me. If yes can you post the code for it? Wonderful! I have been really struggling with this, not on a blogger site, but on a client website I'm designing that includes a blog element. So many complicated solutions, and simple CSS was exactly what I was looking for. Worked perfectly! Thank you!